Well, here we are again, but this time it’s a little different. 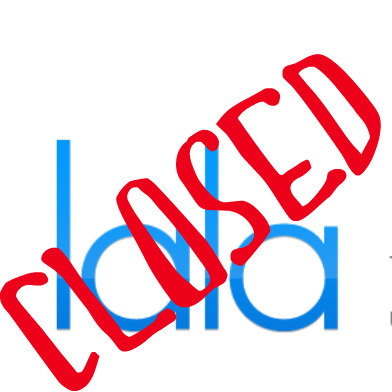 Bay Area cloud-based music service (and former CD trading service) LaLa, informed users by way of an online message, (and then an email) that operations will end on May 31st, 2010. Back in December, we reported on Apple’s announcement that they had acquired Lala, which led many to speculate on iTunes in the cloud for 2010. While LaLa’s messaging does not indicate what’s next, it also includes a classy nuance never before offered to music lovers upon service shut down. According to an email sent to all LaLa music lovers this morning, all of the money listeners spent on renting music in the cloud, will convert to an iTunes credit. In appreciation of your support over the last five years, you will receive a credit in the amount of your Lala web song purchases for use on Apple’s iTunes Store. If you purchased and downloaded mp3 songs from Lala, those songs will continue to play as part of your local music library. Remaining wallet balances and unredeemed gift cards will be converted to iTunes Store credit (or can be refunded upon request). Gift cards can be redeemed on Lala until May 31st. THIS IS AWESOME! While imeem deleted everything without so much as a thank you, or even a goodbye, and then converted user data into advertising on MySpace, LaLa and Apple are converting your rentals into mp3 sales of your choice. In this new, graceful scenario, the music lover decides which rentals are worthy of sale. Granted, each stream was only .10, so it’s about .79 loss per track, but considering I spent a few hundred (yes a few hundred) dollars on renting streams over the last few years, LaLa users like me are now able to take what we learned from the music we rented and decide if we actually want to own it. This is sort of like Comcast on-demand shutting down and converting all the movies you rented into free movies to buy at Lost Weekend Video. With ongoing privacy issues swinging the popularity pendulum in the other direction for companies recently announcing F8 partnerships with Facebook, LaLa and Apple did not convert your data into a violation of your rights, it merely created more ITMS experiences. Your privacy is protected, but the money you spent is now a credit in iTunes. While this is less than ideal for someone like me who loved the service, and simply wants it to stick around because I enjoy using it, I remain relieved that my playlists are not suddenly popping up as an imix. With a month left, I can peruse all of the streams I rented for .10 and really consider which are worth buying using my new gift certificate. Meanwhile, I know that the .10 streams yielded revenue (however small) to the artists and distributors who did the deals with LaLa and made music available to the USA masses. The conversion of streaming rentals into purchases after a 5 year rental period serves a music loving population well, and once again leaves an industry wondering what’s next for iTunes. We all know what the next iPhone looks like, but nobody knows how long it will be until we can access our libraries from the cloud. For now, LaLa’s closure and subsequent announcement demonstrates the Apple acquisition was actually about the music – which is far better than closures we’ve endured in the past.